I've used this every day for as long as I can remember! It's perfect for sensitive skin like mine. This lotion is for body or face, but I use it primarily on dry spots of my face. I tend to get dry eyelids, so I put this under my eyes and on my top lid to moisturize. It causes NO irritation and keeps my skin hydrated! Also, it last forever...! I use the SPF 15 moisturizer in the summer months. I don't, however, apply this around my eyes because of the sunscreen!! Instead, I use a small amount on my entire face, avoiding the eyes. I apply this moisturizing after washing my face and then I put my make up on. I don't find it to be oily at all...just let it set in before applying make up. Okay, so this one may seem strange...I use Johnson's Baby Oil to remove my eye make up! It's a little beauty secret from my mom. I have tried several other eye make up removers, and NOTHING works as well as this (plus, you won't find anything cheaper!). It literally removes ALL my eye make up. You are probably thinking, "I don't want oil around my eyes"! Well, it's so mild and causes no irritation to the eyes or lids. The trick is to remove your eye make up first, THEN wash your face. The oil residue washes right off. I put a small amount on a tissue and rub around the eyes until make up is off. BTW, I never go to bed with make up on. If you don't like the idea of baby oil, this Almay eye make up remover works well too! I LOVE this stuff! It works so well for cleaning make up brushes! I think the name "brush bath" is really cute, too. 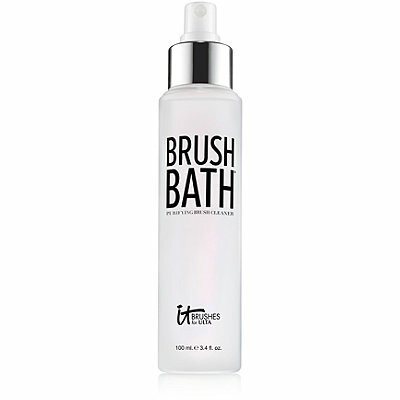 I have to admit, I don't clean my brushes as often as I should...but when I do, I use this cleaner from Ulta. All you do is spray a small amount on a tissue and rub the brush on it to remove residue. The make up comes RIGHT OFF. It's pretty awesome! This is a really nice, inexpensive dry shampoo. It works well and leaves little white residue. Lately, I've been trying to go 3 days before washing my hair. It saves on time! I use dry shampoo on the 2nd and 3rd day. Apply the shampoo to separated sections of the hair (at the root). 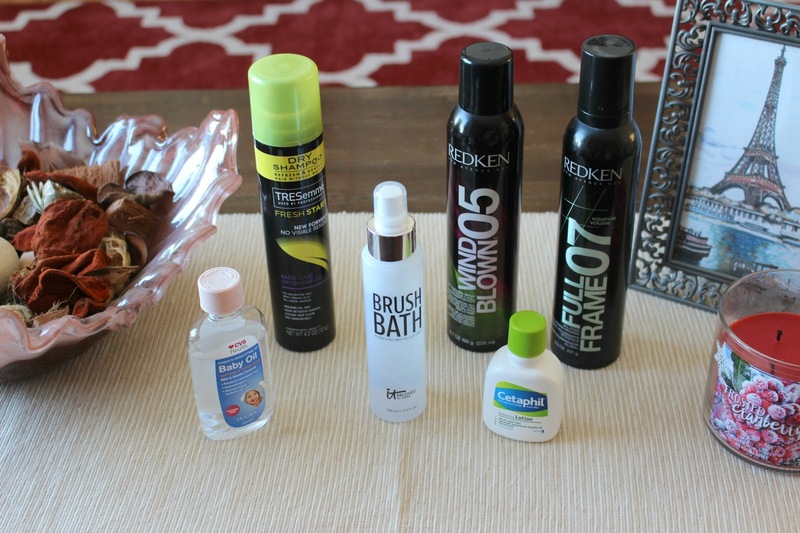 Hold the bottle at least 6 inches from your head when spraying. I shake the bottle between each spray to minimize white residue. Then let the shampoo set it for awhile (I apply shampoo and then do my make up). 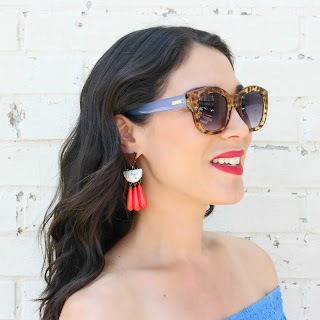 After it has set in and absorbed the oil, brush through your hair to evenly distribute it. That's it! You can shop this dry shampoo at Target for only $4.99! I use this hair mousse to help with volume and body! I apply it when my hair is damp, and then blow dry. I spray a small amount into the palms of my hands, then I flip my head over and apply mousse to the roots, spreading through the foot area with my fingers. I love this product and it really helps with adding volume to your hair! This is one of my favorite hair products. 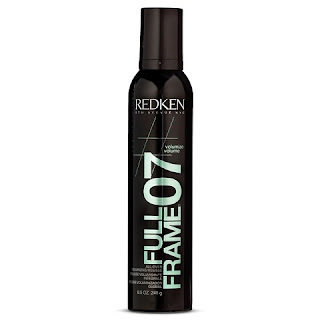 It was recommended to me by my hair dresser and I have loved it every since! This dry finishing spray is perfect for setting your hair after you have blow dried and styled it. I like how it's not sticky but helps with frizz. 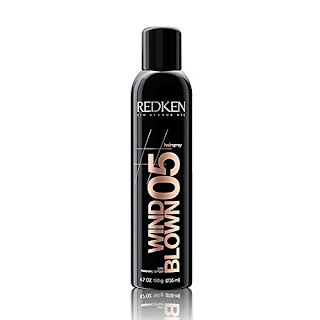 The name is fitting, because it's the perfect spray for a wind blown look! I spray a little bit all over. 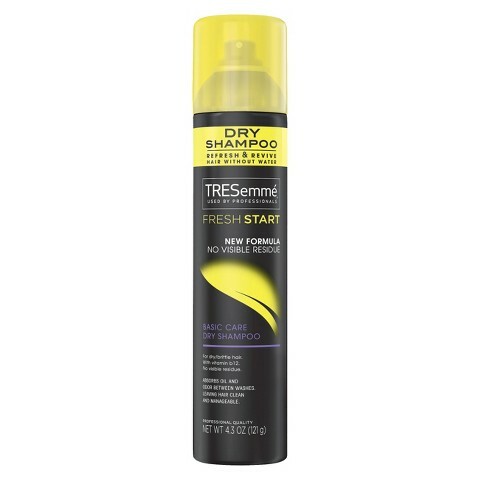 For a maximum hold hairspray, I like TRESemme TRES Two Extra Hold Hairspray. Thanks for stopping by! What are some of your favorite beauty products!? I really like Cetaphil products!! My favorite gentle ones.